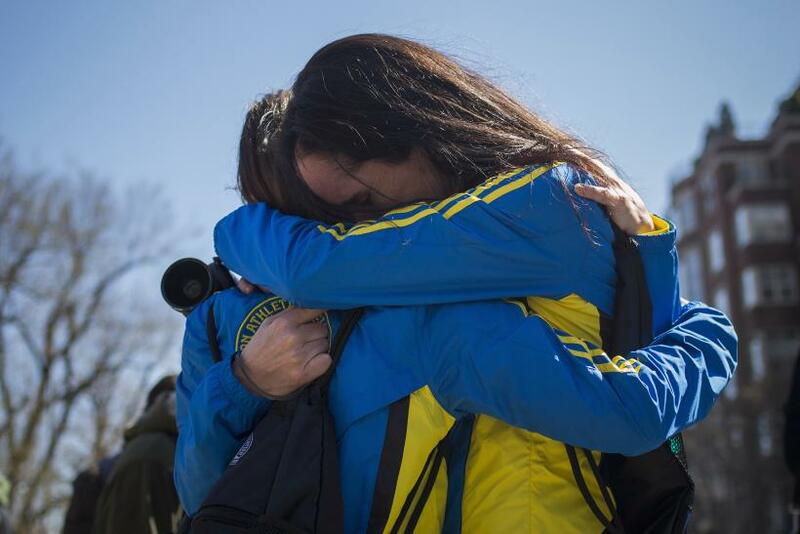 Boston Marathon runners Lisa Kresky-Griffin and Tammy Snyder, left, embrace at the barricaded entrance at Boylston Street near the finish line of the Boston Marathon. In the wake of the tragic events at the Boston Marathon, the running community has responded to the bombing with solidarity and support. With many marathons coming up, safety is a concern, but runners are still signing up. Virginia Brophy Achman, executive director of Twin Cities In Motion, which organizes the Twin Cities Marathon, said there was a surge in registration for the marathon following the Boston Marathon bombing. The Twin Cities Marathon takes place on Oct. 6, with a field of 12,200 runners, and Achman said they are still in the preliminary stages of planning the race and have not had discussions in regards to supporting charity efforts to Boston. “We are still in processing mode, as you could imagine,” Achman said to IBTimes. Even though there have been no formal plans made, she praised the running community for their solidarity in the wake of Monday’s events. Achman noted that the Twin Cities Marathon has a program that lets runners race for a charity of their choice. “Last year raised three-quarters of a million dollars, so I would suspect we would see runners, as individuals, choosing to fundraise for causes that support what happened yesterday,” she said. With many runners competing in different marathons, there is a sense of camaraderie among the athletes. The next big marathon, the Virgin London Marathon scheduled for Sunday, said in a statement they were reviewing all security measures, and London Marathon Chief Executive Nick Bitel said, “The support we have been offered by our stakeholders, London Boroughs and the wider running community has been outstanding. We have the full support of the Metropolitan Police, the mayor's office and other authorities.” The marathon is planning to hold a moment of silence, and organizers have encouraged runners to wear a black ribbon in support of those affected by the events in Boston. Carey Pinkowski, Bank of America Chicago Marathon Executive Race Director, said in a statement, “Our thoughts and prayers remain with our colleagues at the Boston Marathon, and with the spectators, participants, volunteers and loved ones who were affected by yesterday’s tragic events. As a partner in the World Marathon Majors, we offer our full support of the Boston Athletic Association and the City of Boston as they work through the horrific events that took place. We want to reassure those registered for the 2013 Bank of America Chicago Marathon, and the family members, friends and volunteers who plan to support them, that we are in constant communication with the City of Chicago, the Office of Emergency Management and Communication, the Chicago Police and Fire Departments regarding the security plan that is implemented at the Chicago Marathon. As our top priority, we work in lockstep with these agencies to ensure the safest possible event for everyone involved. As we do each year and throughout the year, we will sit down with these agencies and conduct a comprehensive security review as part of the planning process for this year’s event.